Our From50 plans give you peace of mind, with a payment plan that suits you. Funeral plans tailored to suit your needs. 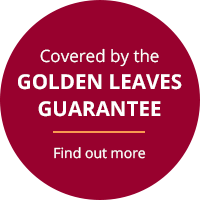 The Golden Leaves FROM50 Funeral Plan is a straightforward, affordable way to pay for the funeral you want. This is a valuable opportunity to take in today’s society, where the backdrop of spiralling funeral inflation has heaped additional strain on a population already facing widespread financial hardship. Today, planning your funeral service and pre-paying its costs in advance is clearly making more sense than ever before. In light of this, we have added a variety of new payment options in this new edition, to provide you with more choice. Purchasing one of our pre-paid plans will enable you to not only secure the future funeral services that you specifically desire, but help remove a number of issues for your next of kin. If, during the course of making your decisions, you do not find certain services you require listed in any of our set plans, don’t worry – call us on the free phone number provided and our helpful team will be able to produce a bespoke plan that conforms to your every wish! Pre-planning and paying for your funeral is one of the most thoughtful things you can do to help those close to you cope with bereavement. Why not do it today and get on with living your life? Pay over 12-60 months by direct debit. Available to people aged between 50 and 75. With all funeral plans that are paid by way of Fixed Monthly Payments, it is possible (depending on how long you live) to pay more into the plan than it pays out to provide your stipulated funeral services on death. With our new FROM50 Funeral Plan though, we have sought to alleviate this problem. Due to our Plan’s totally unique Overpayment Rebate Benefit feature, if the sum of the Fixed Monthly Payments you have paid in total more than the sum paid out to Golden Leaves Limited to fund the funeral service on death; your estate will be eligible for a rebate of a percentage of this amount.